Years I ago I went tubing down a river. It was a calm river and good thing as most of my body was in it as I cling to the large inflatable donut. Rubber is slippery when wet don't you know, and my Hobbitesque frame fits nicely through it. Good times. That is on the fun side of things to float down a river in. On the other side as anyone familiar with Niagara Falls can tell you is barrels. Open-barrels especially. They seem awfully top-heavy and difficult to balance in. But that's got to be an improvement over being sealed into one and bouncing around upside down. As it turns out that's actually quite bad for Dwarf health. Who knew? Thorin: Leaders put on brave faces. Poor Bilbo! Someone save him! When Middle Earth meets MTV's Jackass. Oh my Gandalf, I love this! 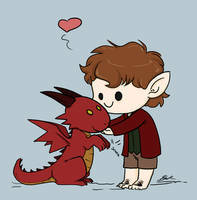 Poor little Bilbo Baggins! Whatever doesn't kill him makes him stronger. Please remain seated and keep your legs arms feet hands and whole self in the barrel at all times until the ride is has come to a full stop, thank you and enjoy. Commemorative photos available for $50. Treasure your memories of near-death with your friends and family who survived. Roller coaster ride! With water. This made me laugh so hard... I love this! Also I watched the movie two days ago.. And Bilbo was totally like that!!! I just realised that Bilbo is drowning in dwarf vomit! Yes, that is pretty much how it would go down! I cannot wait to see this scene in the movie! And it's finally time to find out. so true once in the goblin tunnels and now in the river. why didn't you ask him if he could swim? Maybe they just assumed he's a river hobbit. Lol. I do so enjoy that part how they escape Thranduil. Excellent. It is a great scene. lol, I feel so bad for Fili, Kili, and Bilbo. I feel ya, I feel ya. Hahahahahahaha!!!!! So funny!! That -Fili, Kili and Bilbo all at the same time- is also me on any ride I go on!! That's why they made safety harnesses and vomit bags. And it is a good thing too. I think a barrel ride would be fun!!!!! Once he spits up the river.